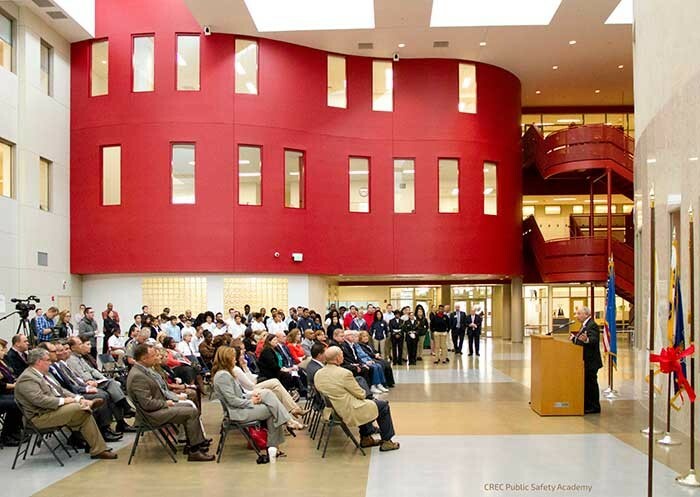 USA – CREC Public Safety Academy opened their modern new facility in September 2014 with audio systems that support the school’s career-oriented education for grades 6 through 12 in law enforcement, fire sciences, emergency medicine and other safety and security fields. The school’s large and attractive new facility serves 700 students and includes classrooms equipped with the latest technology, a gymnasium and fitness centre, a cafeteria and multi-purpose room along with a theatrical auditorium. Jorge Guillén of Guillén Technology Consultants provided building technology, AV, audio systems and safety and security consulting services for the new school. The building’s many different spaces presented Guillén with numerous challenges in his audio system designs. 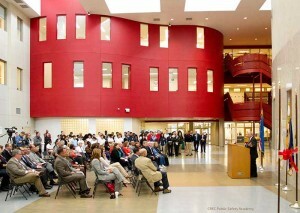 The school’s goals included intelligible voice paging and high-quality sound reinforcement throughout. However, acoustics varied considerably from room to room and several areas had high ceilings and hard, reflective walls, floors and ceilings. Guillén chose Community loudspeaker systems to help him overcome these acoustic challenges and meet the school’s goals. He used Community R SERIES loudspeakers in the gymnasium and multi-purpose rooms and D SERIES loudspeakers in the multi-purpose room, cafeteria, fitness centre and library. He designed the auditorium sound system with I SERIES IHP-1566 loudspeakers, i215S subwoofers and MX41E-94B floor monitors. Guillén designed electronics systems to fit the needs of each room. He used Rane amplifiers, mixers and system processors, Samson wired and wireless microphones and Listen Technologies assistive listening systems. 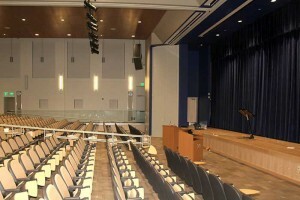 For the auditorium, he included a PreSonus digital mixer and a Telex theatrical intercom. The systems were installed and commissioned in time for the school’s opening and Guillén says the Community loudspeakers helped him achieve consistently high-quality sound throughout the building’s many different spaces. Working with and for its member districts, the Capitol Region Education Council (CREC) has developed a wide array of cost-effective and high-quality programs and services to meet the educational needs of children and adults in the region. Established in 1966, CREC brings nearly five decades of experience in education, regional collaboration, and operations to provide innovative strategies and products that address the changing needs of school districts and their students. CREC manages more than 35 facilities throughout the Greater Hartford, CT area, offering more than 120 programmes to more than 150,000 students including 19 inter-district magnet schools.